[Silas] is a student at Olin College and came up with a platform using the singularity drive system in his spare time. We covered a LEGO build of a singularity drive earlier this month. Instead of wheels, treads or legs, this drive system has a hemisphere spinning along its vertical axis. 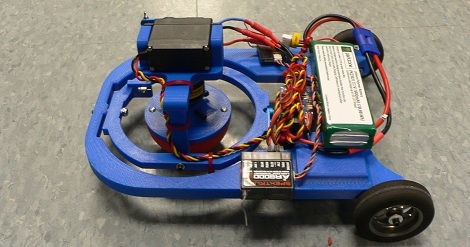 Interestingly, the robot does not change the speed or direction of its drive motor at all. IEEE is now calling this drive system a “singularity drive,” because math. What makes [Silas]’ build really neat is that the entire platform was fabricated on a 3D printer. Unlike the previous singularity platform, We’re hoping he puts his design up on the web; a triple-singluarity drive platform inspired by a Kiwi robot would be very cool. Not as face-meltingly awesome as one you can ride in, but still very cool. Check out the video below for [Silas]’ demo of the build. ← Hackaday Comment Policy; We’re cleaning up. Also be sure to use some sort of non-marking rubber/plastic. That could be dastardly if you put a rubber that would leave marks and turned it loose on a gym floor. @anton judging by the rapid turning power of that thing I am wondering if a balanced gyro stabilized platform wouldnt tip and dig in on a fast turn. That is some superb agility! In the article behind the link it is stated that the wheel isnt perfectly centered. And a possible solution is to print the wheel. But wouldnt it be easyer to put a little edge around the mounting base so that the ball will fit inside the base? Also maybe the rubber bends at high speed, so it actually is centered but the ball flexes at high speed. I am inspired because this is some kind of Continue Variable Transmission i have never seen before! I see a bright future ahead for Silas. So many applications! from uncatchable toy bot to polishing machines. The list is endless! To solve that, get rid of the wheels and add 2 more singularity drives. Like a tricopter. 2) move in precise directions/distances at a predictable speed? It would be awesome if it could (and turn at any angle on a dime), I would love to parallel park one of these! Face-meltingly awesome :-) wonder what happens as you load up the face of the hemisphere? Presumably you’d need more torque to drive it as the rubber deformed. Could it be scaled? 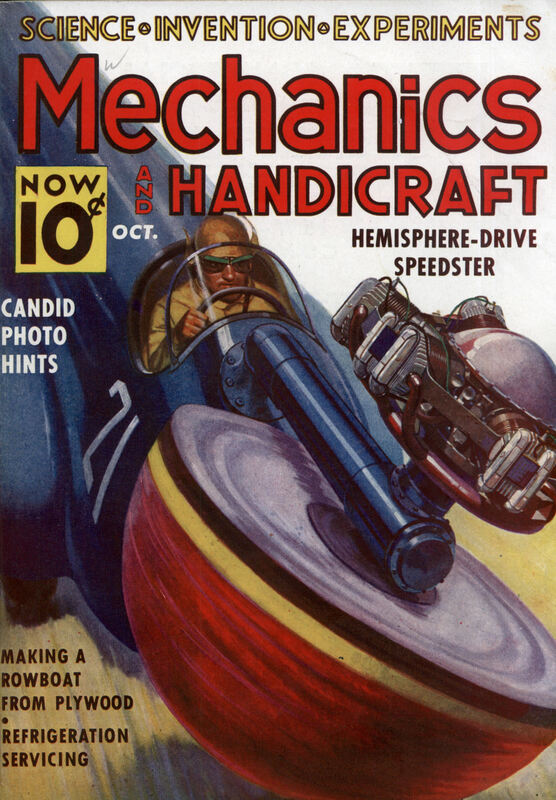 (hopefully into the wicked 50s style futuristic racer complete w a dude wearing leather goggles and wrestling a giant steering wheel :-) ). Seriously though – scaled up – surely you’d be riding a perpetual burnout? @Remarknl I would do a quad singularity drive instead of 3, would look more like a car, but could travel in any speed in any direction equally. Wants one. But I want someone to make a system with four of these, opposite sides contra-rotating, for some delicious strafing action. Also if it was a quad singularity drive platform and you alternated which direction the platforms leaned it wouldn’t be as likely to tip. IE, To go forward the front two drives lean outward and the back two drive lean inward. That’s pretty awesome! But I have to ask… How does it handle under a load, say about 1.2 kg for one the size of that? Also, how would it handle on less than idea surfaces like dirt, gravel, grass, wet floor, ect. I would like to explore more into this kind of ‘omni-wheel’ drive system. Also what material (PE, HDPE, ABS, ect) and what type of printing (extrusion, ink jet, diffuse light lithography, ect) technique did you use to print this? I apologize if I’m asking too many questions and once again, pretty awesome. wasn’t ‘singularity drive’ the name of the engine for the ship in that movie Event Horizon? Nice clean design. I love 3d printed toys, this is a great example of 3d printing at its finest. Any chance of sharing the 3d model for experimentation purposes? Singularity drive. It’s the new Omni-wheel! Reply to Anton, that already has been done! Just wondering: how big an engine would you need to drive the planet through the galaxy? -As far as adding two more drives, I am fairly sure that I would be able to have full range of motion with only two drive wheels, and my control system would be a lot simpler than if I had three. With traditional omniwheels, at least three are needed because they can only drive in one direction on their own. This drive mechanism can actively drive in all directions on a 2d plane. -I am starting to feel that the ball may be centered and it is just deforming under high speeds. I am not sure. Either way, I will be looking into new methods of making the drive hemisphere. -This platform does have the complete potential to drive in a perfectly straight line and be completely maneuverable in small spaces. However, this would be greatly aided by a control loop of some form. Right now it is fairly drivable because I have tuned the servo limits and added exponential to my control. However, I need to know how it will react under different condition and drive it accordingly; ideally, a smart control loop would fill in that gap between what I want it to do and making it do it smoothly. -I designed this to be driven with the regular wheels in front, but for some reason it was easier to control driving in the other direction. -This platform has plenty of power to handle a 1.2kg load, if not much more. I feel like it would actually handle better. The biggest issue is that the rubber hemisphere will be pushed deeper into the surface it is riding on. On a hard floor, I think it would drive better, but on a rug I think it would put a tremendous load on the motor. -The original inspiration for this project was to take the IEEE drive mechanism and see how it would work scaled up. I scaled up the drive mechanism, but the chassis itself is still very small. Judging by how it drives now, I think it would drive better if the body were significantly larger. -The platform is ABS plastic and was printed using an extrusion method. -I completely plan on sharing my CAD files for this project and all my other projects. However, I need to find a reasonably robust (and hopefully free) method of hosting those files. I know there are tons of services out there; I just need to pick one. In all seriousness, that’s a really cool drive. I’m sure some novel applications can be dreamed up. I’m not sure having more than one of these would actually help. As Remarknl mentioned, this is a variation on the Continuously Variable Transmission where the ground has become the second half of the transmission. With one drive ‘wheel’, motion is controlled by how the hemisphere touches the ground, with more than one you have a control scheme similar to omni(or mecanum) wheels but requiring more motors to actuate. On the other hand you may see better drive efficiency, so it may come down to what your design constraints are. A interesting concept none the less and a very nice build. I want to see one of those wheels reverse engineered into a Reliant Robin to replace the front, drive wheel! @by_glitch: The link you provided states that the front wheel is for steering and the engine drives the rear axle. So you could gut a lot of the existing bits and reduce weight while retrofitting this drive source. Sounds like win/win! Somebody submit this idea to Top Gear. I really wanna play with it, and tinker a bit :D.
This is very cool and I love the idea. The simplicity of a single drive is beautiful but seems a little unstable (see it tilting on the chassis in the video), maybe it could have two or more of these drives? Maybe even four? Hopefully Silas continues to study this! I would love to see one of these made invertable with the moter in the middle of two of the ball like wheels. I’ve seen a few of these types of bots lately on HaD. Honestly they’ve got me thinking. A big thanks to Berend for the link to the ball balancing bot. I don’t have the money to do it myself- but I would absolutely love to see a quadropod or hexapod with something similar attached to a rig with dampening system (like shocks and struts) mounted on the legs. The lower speed walking would be great for rougher terrain and maneuverability, while high-speed directional movement would be driven by the aforementioned mechanism. It shouldn’t be too difficult to construct a ring of bearings to keep the ball in place while walking. It’d be quite the platform. I want to build a segway with a pair of these instead. Once the wheel engineering and design has been worked out the rest is a piece of cake. Anyone know of a material thats extremely wear resistant, marginally flexible and has a high coefficient of friction? because math what? or is it because of math?